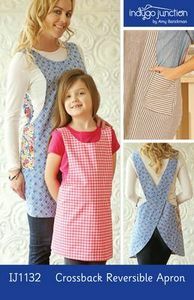 This reversible apron slips on over your head & is ideal for kitchen or garden work. Adult & child versions are included with multiple sizes for both. The crossback straps make fitting a breeze. Child sizes: S (4/5), M (6/8), L (10). Indygo Junction Great Fit Gored Skirt Sewing Pattern XXS-XXL.